The Families First conference was our big chance to listen and learn from families (page 8), but it also gave an opportunity for carers to make themselves heard and influence Adfam’s future work programme. ‘Be vocal, get lobbying,’ said Paul Hayes. ‘Help me to make my colleagues better at listening,’ said Dr Steve Brinksman. This issue of DDN is full of opinion on what works (and doesn’t). George Gallimore comments on the risk of fragmentation after police and crime commissioner elections (page 20). Amar Lodhia criticises lack of support for entrepreneurs from disadvantaged backgrounds (page 17). And hosting its final conference, the UKDPC’s chair Dame Ruth Runciman says ‘We need a new conversation about drugs’. We wish you a healthy and happy Christmas and New Year – tweet us @ddnmagazine until we return in January. Many thanks to those of you who bought Christmas cards, displayed on our centre pages – you helped to make this issue possible. 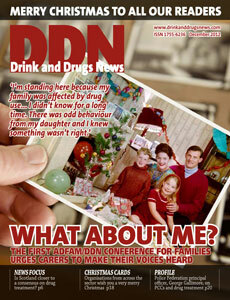 There’s still time to have a DDN e-card – please get in touch! The first Adfam/DDN conference for families affected by drug and alcohol use urged carers from all over the country to make their voices heard. DDN reports. Duncan Selbie describes how Public Health England will work with the treatment sector and promises to improve the public’s health within five years. DDN reports. Drugscope’s recent conference focused on how the sector could deliver high quality services in uncertain times. DDN reports. Grateful thanks to all those who bought a DDN Christmas card. George Gallimore talks to Davis Gilliver about how PCC’s could affect the relationship between the criminal justice and treatment sectors. The UKDPC’s final conference saw politicians, policymakers, commentators and media representativs gather to discuss where next for drug policy. DDN reports. DDN takes you back through a year of negotiating upheaval.